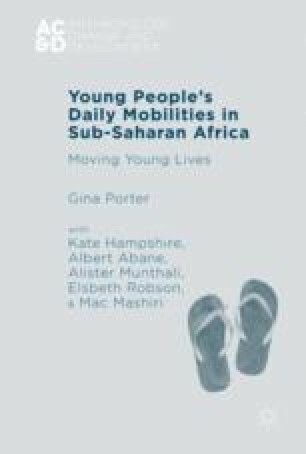 This introductory chapter describes the research gap that existed regarding young people’s everyday mobilities and immobilities in sub-Saharan Africa prior to the field studies on which this book is based. It introduces key issues and concepts that are central to ensuing discussions on this theme, setting the work within the context of the ‘new mobilities paradigm’, the politics of mobility and the conceptual and methodological significance of walking for this study. The crucial importance of age, gender and relationality as shapers of young people’s agency is highlighted in subsequent sections. The chapter concludes with a note on authorship, since the book builds from field research on young people’s mobility in a number of different projects (mostly conducted in urban and rural sites in Nigeria, Ghana, Malawi and South Africa but also informed by wider field experiences elsewhere in the continent). Sheller, M. (2011). Mobility. Sociopedia.isa doi: 10.1177/205684601163.